America’s health care is at or near the top of the list of issues that voters prioritize in most surveys. California voters are no exception, and with good reason. Following the passage and implementation of the Affordable Care Act (ACA, or Obamacare) and its new regulations and taxes, Americans saw massive increases in insurance premiums and a disappearance of insurance options across the country. In its first four years, ACA insurance premiums for individuals doubled and for families increased by 140 percent. This occurred even though insurance deductibles increased by over 30 percent for individuals and by over 97 percent for families, according to eHealth.1 As time passed, insurance options and prices on ACA exchanges continued to worsen, according to the US Department of Health and Human Services (HHS).2 For 2018, only one exchange insurer offered coverage in each of approximately one-half of US counties. Moreover, many exchange enrollees continue to face large year-on-year premium increases in 2018, according to a Kaiser Family Foundation analysis, even in the face of markedly higher deductibles.3 And the spectrum of doctors and specialists accepting that insurance continues to sharply narrow, with far fewer specialists than outside ACA exchanges.4 Now, almost 75 percent of plans are highly restrictive.5 The ACA regulatory environment has also encouraged a record pace of consolidation across the health care sector, including mergers of doctor practices and hospitals.6 This is bad for patients, because research has consistently shown that prices are lower when there are more competing hospitals for insurers to contract with.7 The last period of hospital mergers increased medical care prices substantially, at times over 20 percent, according to a Robert Wood Johnson Foundation report.8 Robinson and Miller reported that when hospitals owned doctor groups, per-patient expenditures were 10 to 20 percent higher, or an extra $1,200 to $1,700 per patient per year.9 Capps found that physician prices increased on average by 14 percent for medical groups acquired by hospitals; specialist prices increased by 34 percent after joining a health system.10 In the wake of the ACA, overall health-care expenditures continue to increase and choices narrow—for individuals and for employers, as well as for taxpayer-funded government programs. Californians have also experienced substantial impacts from the ACA. Since the law’s passage, the uninsured population has decreased in California to about 8 percent but California’s reliance on government health programs has greatly increased. As of 2016, a full 27 percent of Californians were enrolled in Medi-Cal (California’s Medicaid insurance), a 50 percent increase since 2008 and about 30 percent higher than the 2016 national state-by-state average, according to the Kaiser Family Foundation.11 In fact, the vast majority of those newly insured are on Medicaid, not private insurance. Why is that a problem? First, regardless of labeling people as “insured,” most doctors do not accept new Medicaid patients.12 Less well known to the public is that about half of doctors who signed contracts to accept Medicaid patients in truth do not, according to the government’s own HHS data.13 That refusal to accept Medicaid is not difficult to understand, given that California Medi-Cal pays barely half of Medicare’s rates—doctors and hospitals cannot provide care when they lose money per patient served. The second problem with shifting more patients to Medicaid is that Medicaid patients receiving care suffer worse health outcomes than similar patients on private insurance, likely due to Medicaid’s stricter limits on covered diagnostics, drugs, and treatments. Third, there is a massive cost to taxpayers for expanding Medicaid, even though it is substandard in every meaningful way. Since ACA passage, California’s Medicaid spending growth has more than doubled (11 percent growth during 2010–14, compared to 5.4 percent during FY 2007–10, according to the Kaiser Family Foundation), to become the state with the nation’s highest annual growth of Medicaid spending.14 A full 38 percent of California taxes are used to fund Medi-Cal.15 This massive amount of taxpayer money was not necessarily spent appropriately, either, according to the Office of the Inspector General. Its report of February 2018 concluded, “California made Medicaid payments of $738.2 million ($628.8 million Federal share) on behalf of 366,078 ineligible beneficiaries and $416.5 million ($402.4 million Federal share) on behalf of 79,055 potentially ineligible beneficiaries.”16 Separately, hospital mergers have already been particularly harmful to California’s health-care consumers. Melnick and Fonkych of the University of Southern California found that prices at hospitals in the largest systems exceeded prices at other California hospitals by almost $4,000 per patient admission. Prices grew at larger, multi-hospital systems over 50 percent more than at other hospitals.17 Given the consolidation trend now seen under the ACA, this portends even higher future prices for Californians unless reforms are implemented. In response to the need for reforming health care, California voters have a choice between two fundamentally different pathways: (1) a single-payer, government-centralized system, based on increasing government regulation and authority over health care and health insurance, all intended to broaden health-care availability to everyone while minimizing concern for price; or (2) a competition-based, consumer-driven system, based on removing regulations that shield patients from considering price, increasing competition among providers, and empowering patients with control of the money, all intended to reduce the costs of medical care and enhance its value, providing broader availability of higher quality care for everyone. How about single-payer health care for California? The notion that single-payer health care represents an excellent idea for health system reform is mainly driven by the intuitive attractiveness of a simple concept: the government explicitly “guarantees” medical care. Indeed, many nations claim to “guarantee” health care; many further insist that such health care is provided “free of charge.” For instance, England’s National Health Service constitution explicitly states, “You have the right to receive NHS services free of charge,” despite taxing citizens about £125 billion per year, equivalent to $160 billion per year. Not surprisingly, independent estimates for single-payer health care proposed for California would cost about $400 billion per year, more than double the state’s entire annual budget.18 Massive new taxation would be required. In those countries with the longest experience of single-payer health care, published data demonstrate massive waiting lists and unconscionable delays that are unheard of in the United States. In England alone, a record-setting 4.2 million patients are on NHS waiting lists.20 A total of 362,600 patients waited longer than four months for hospital treatment in March 2017, an increase of almost 64,000 over the previous year; 95,252 have been waiting more than six months for treatment; and more than 3,400 patients are waiting more than one full year as of July 2018.21 And this was after already receiving initial diagnosis and referral. As of late 2016, the average waiting time exceeded one hundred days for hip or knee replacements, hernia repair, and tonsillectomies. In Canada’s single-payer system, the 2017 median wait from a general practitioner appointment to a specialist appointment was 10.2 weeks.22 When added to the median wait of 10.9 weeks from specialist to first treatment, the median wait after seeing a doctor to start treatment was twenty-one weeks, or about five months. For simply an appointment with a qualified specialist, a Canadian waits 13.4 weeks (three months) for an ophthalmologist; a Canadian waits to see a neurosurgeon for 22.1 weeks (five months); and a Canadian will endure bone and joint pain for 17.9 weeks (four months) while waiting to see an orthopedist. These long waits are standard for single-payer systems, but they stand in stark contrast to US health care. In fact, US media outrage was widespread and cited as a wake-up call for whole-system reform when 2009 data showed that time-to-appointment for Americans averaged 20.5 days for five common specialties.23 (Note that after the implementation of the ACA, wait times in 2017 increased by 30 percent since 2014.24) That selective reporting failed to note that those waits were for healthy check-ups in almost all cases, by definition the lowest medical priority. Even for simple physical exams and purely elective, routine appointments, US wait times are far shorter than for seriously ill patients in countries with single-payer health care. In single-payer systems, patients are dying while waiting months after their doctors recommended urgent treatment, including those referred for “urgent treatment” for cancer. More than 19 percent currently wait more than two months for their first urgent treatment in single-payer NHS England and recommended brain surgery.25 (In England, 17 percent wait more than four months). In Canada’s single-payer system, the most recent data revealed a median wait for neurosurgery after already seeing the doctor of 32.9 weeks—about eight months.14 Canadians diagnosed with heart disease waited a median time of 11.7 weeks for their first treatment. And in Canada, if you needed life-changing orthopedic surgery, like hip or knee replacement, you would wait a startling 41.7 weeks—longer than it takes from fertilization to a full-term human newborn. Single-payer systems cannot even outperform the US system in something as scheduled and routine as cancer screening tests. Confirming numerous prior studies by the Organisation for Economic Co-operation and Development, Howard reported in 2009, before ACA requirements, that the United States had superior screening rates to all ten European countries with nationalized systems (Austria, Denmark, France, Germany, Greece, Italy, the Netherlands, Spain, Sweden, and Switzerland) for all cancers.31 Likewise, the single-payer system of Canada fails to deliver screening tests for the most common cancers as widely as in the US system, including Pap smears, colonoscopies, and PSA (prostate-specific antigen) tests.32 And Americans are more likely to be screened younger for cancer than in Europe, when the expected benefit is greatest. Not surprisingly, US patients have less advanced disease at diagnosis than in Europe for almost all cancers. Single-payer systems in countries with decades of experience have proven to be inferior to the US system in virtually every important objective measure of access to care and quality. And the consequences of delayed access to medications, diagnosis, and treatment in single-payer systems are significantly worse outcomes from virtually all serious diseases. According to the data—peer-reviewed publications in the world’s leading medical and scientific journals—the United States system, not single-payer systems, has the best survivals from cancer and the best treatment outcomes for serious chronic diseases like diabetes, high blood pressure, stroke, and heart disease.33 It has the broadest usage of screening tests for early cancer detection and the fastest access to new, life-saving drugs.34 It has the best access to safer, more accurate diagnostic technology that forms the crux of modern care and the quickest access to life-changing surgeries like hip and knee replacements permitting pain-free mobility and vision-restoring cataract surgery and fastest access to specialty-trained doctors.35 Also, the United States is the number one source of the world’s leading health care innovations by virtually every known metric. Even more ironic is that today’s single-payer systems have turned to private care to solve their failures. In one year alone, £901 million targeted for medical services by the UK government was used to buy care from private and other non-NHS providers, as reported by the Financial Times.36 Sweden has increased its spending on private care by 50 percent over the past decade and has abolished its government’s monopoly over pharmacies.37 Some countries with single-payer systems even divert taxpayer money to pay for care in other countries. Since 2007, patients using taxpayer-funded single-payer health care could choose a private hospital in Denmark or a hospital outside the country if the waiting time for the treatment exceeded one month. Notably, private insurance in the European Union has grown by more than 50 percent in the past decade, specifically to fill the “ever growing gaps in coverage left by public systems,” according to the European Insurance and Reinsurance Federation.38 And more than fifty thousand British citizens travel out of the country per year and spend £161 million out of pocket to receive medical care, even though they are already paying for their NHS insurance. Instead of following failed models of the past, California has an opportunity to lead the nation and innovate in health care reform. Rather than expanding government programs, issuing false guarantees, and dramatically increasing taxes, reforms should focus on what truly is the essential policy goal: making excellent medical care broadly available and affordable. The direct pathway to broadening access to the excellence of American medical care rests on reducing the cost of medical care itself. This can be accomplished without restricting its use, i.e., avoiding the way that governments regulate costs in single-payer systems. Decreasing the cost of care to make it available to everyone requires creating conditions long proven to bring down prices while simultaneously improving quality: incentivizing empowered consumers to seek value, increasing the supply of medical care, and stimulating competition among providers. The first critical policy step is to instill far stronger incentives for patients to save money when considering health care and to equip consumers with the tools to do so. Could patients consider price when they need medical care? Among privately insured adults under age sixty-five, almost 60 percent of all health spending is for outpatient care.39 Only 20 percent is spent on inpatient care, while emergency care represents only 6 percent of health spending.40 Of the top 1 percent of spenders, the group responsible for more than one quarter of all health spending at an average of $100,000 per person per year, a full 45 percent of spending, is also outpatient.41 Likewise, 60 percent of Medicaid money is spent for outpatient care.42 Outpatient services dominate America’s health spending and these are amenable to price-conscious purchasing. To increase downward pressure on prices of medical care from patients, it is important to position more patients as direct payers for health care. This has already been proven by our experience with procedures paid directly by patients, like the early days of LASIK corrective vision surgery and head-to-toe CT screening. We also know value-seeking patients reduce prices by almost 20 percent for outpatient care, like MRI and outpatient surgery.43One key is permitting widely available, higher deductible insurance plans (HDHPs) with fewer coverage mandates and cheaper premiums. Higher deductibles necessitate direct patient payment for care up to the deductible. Eliminating misguided ACA regulations would allow more flexible, cheaper insurance to be an option to all Californians, with premiums of one-third to one-fourth those of today’s ACA-regulated plans, per eHealth data from Q4 2016.44A second highly effective tool to motivate patients to consider price is large, liberalized health savings accounts (HSAs). Tax-sheltered HSAs typically pay for non-catastrophic expenses, the bulk of medical care. Better than tax deductions, HSAs incentivize saving. When people have savings to protect in HSAs, the cost of care comes down without harmful impacts on health.45 The fundamental purpose of an HSA is not simply to provide a tax-sheltered benefit for individuals in order to cushion the blow of high health care expenses. HSAs reduce the price of care for everyone, including those who do not own HSAs. Raising maximum contributions to at least match annual out-of-pocket limits for ACA marketplace plans (for 2018, $7,350 for individuals and $14,700 for families), allowing HSA payments for the holder’s elderly parents, ending “use it or lose it” rules, and permitting rollovers to surviving family members would reward people to save and consider prices when contemplating medical care. Large HSAs, de-linked from specific insurance deductible requirements, should be available to everyone, including all seniors on Medicare, the biggest users of health care. Motivating seniors to seek value is crucial to driving prices lower for everyone else. Another essential component to harness the price-reducing power of consumers is that the visibility of prices to patients must be radically improved. Evidence from MRI and outpatient surgery centers shows that price transparency encourages price comparisons by patients, which reduces prices for everyone, as cited earlier. The most flagrant situation is in prescription drugs, in which complex behind-the-scenes rebates of $179 billion to pharmacy benefit managers (PBMs) prevent any price consideration by patients.46 Worse, many PBM contracts prohibit pharmacists from volunteering that a drug may be cheaper if purchased at the “cash price” with contractual “gag clauses,” according to a 2016 survey.47 Recent data show a scandalous fact: over 20 percent of copays exceeded actual total drug costs, with the PBMs pocketing the difference from naïve patients.48 In a December 2017 Consumer Reports study, the thirty-day supply price of common generics showed a ten-fold to seventeen-fold variation per drug in the same city.49 For the nearly forty million seniors taking five or more medications daily, the savings from comparison shopping could be many hundreds of dollars per month. Price transparency is essential to allow price comparisons by patients. Arrangements to hide prices must be outlawed. As in every other market, doctors and hospitals would post prices and qualifications once they are competing for price-conscious patients who control the money. The second major policy step is to increase the supply of medical services to stimulate competition. In large part, this means removing archaic barriers to competition. We need to remove anticompetitive scope-of-practice limits on nurse practitioners and physician assistants. In a 2011 review, 88 percent of visits to retail clinics involved simple care.50 Care was 30–40% cheaper than at physician offices and about 80 percent cheaper than at emergency departments.51 And patients reported high levels of satisfaction.52 Additionally, two-thirds of the 2025 projected shortage of 124,000 will be in specialists.53 Yet medical schools have prevented any increase in graduation numbers for almost forty years and medical societies have maintained protectionist training program limits. These rigid limits restrict competition. Similarly, anti-consumer barriers to cross-state doctor licensing must be eliminated, especially as we enter the age of telemedicine, a clear opportunity for more efficient care at lower cost. California should lead in issuing reciprocal physician licenses. The third policy step is to introduce the right incentives into the tax code and eliminate the harmful, counterproductive incentives that have been perpetuated for decades. Today’s unlimited income exclusion from taxes for employer-provided health benefits contributes to higher prices of care because it encourages higher demand for care, regardless of cost, while distorting insurance into covering almost all services. California’s personal income tax exemptions for these totaled about $8 billion in 2017–18.54 Likewise, ACA insurance subsidies or tax credits artificially prop up high insurance premiums for coverage that minimizes out-of-pocket payments. This is counterproductive—it prevents patients from caring about price and reduces incentives for providers to compete on price. Any new tax reform should cap health care deductions and limit those deductions or income exclusions to catastrophic premiums and HSA contributions, changes which would ultimately reduce health care prices. Fourth, California should reform Medicaid to eliminate today’s separate, substandard system for the poor and create a bridge to the excellent medical care that the privately insured use. The ACA’s misguided expansion of Medicaid continued the second-class health care system of the poor at a cost of $500 billion per year to taxpayers that will rises to $890 billion in 2024.55 California should lead by transforming Medi-Cal into a program geared toward transitioning poor people to private coverage, with the same access to quality medical care that everyone else has. Several states have received special waivers to use current Medicaid funding toward this aim. Seema Verma, administrator of the Centers for Medicare and Medicaid Services, strongly supports this concept. California’s new Medi-Cal should use current federal funds toward premiums on limited-mandate private insurance and liberalized HSAs for the poor. HSAs would provide new incentives for lower-income families to seek good health through wellness programs and healthy behavior in order to save and protect their new, growing financial assets. With these reforms, doctors and hospitals would receive payments from the same insurance as from non-Medicaid patients. The limited choice of doctors and the substandard treatment options would be eliminated. US health care demands reform. Health care costs are unsustainable and increasing. That high cost leaves some people, particularly the poor, isolated from the proven excellence of US medical care. Because much of health care is controlled at the state level, California has an opportunity to lead the way toward high-quality, more affordable care for all its citizens. Contrary to their false guarantees, government-centralized, single-payer systems hold down health care costs mainly by strictly limiting the use of medical care, drugs, and technology through their power over patients and doctors as the payer. By the data, single-payer health care has been proven, worldwide, to be far inferior to the US system, with severe costs far beyond requiring massive tax increases. And make no mistake about it: America’s most vulnerable, the poor and the middle class, will undoubtedly suffer the most if the system turns to single-payer health care because they will be unable to circumvent that system. California should consider a different approach: facilitating competition among providers of care for price-conscious consumers.56 Broadly available options for cheaper, high-deductible coverage less burdened by regulations, markedly expanded HSAs, and targeted tax incentives to unleash consumer power are keys to injecting price sensitivity for health care. Coupling those with strategic increases in the supply of medical care would generate competition and reduce the price of health care, expanding access to quality care for everyone. 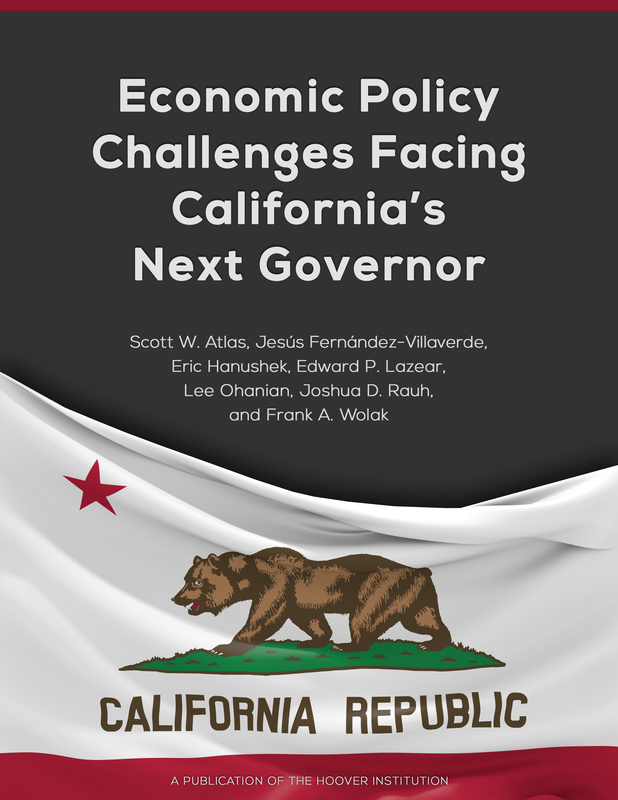 The value of these policy reforms for California is substantial. Taking all of these reforms together, I estimate that private health care costs would decline by about $2.75 trillion nationally over ten years and that government health care costs would decline by about $1.55 trillion nationally over ten years. With 12 percent of the country’s population, this suggests private cost savings of about $330 billion in California over ten years and about $186 billion in state and local government savings over ten years. Scott W. Atlas, MD, is the David and Joan Traitel Senior Fellow of Stanford University’s Hoover Institution and a member of Hoover Institution’s Working Group on Health Care Policy. Dr. Atlas investigates the impact of government and the private sector on health care access, quality, and innovation. He is a frequent policy adviser to government and industry leaders, having been senior adviser to candidates for president of the United States in the 2008, 2012, and 2016 campaigns. His most recent book is Restoring Quality Health Care: A Six-Point Plan for Comprehensive Reform at Lower Cost (Hoover Press, 2016). His writings and interviews have appeared worldwide, including the Wall Street Journal, Financial Times, CNN, Fox News, BBC, PBS News Hour, Brazil’s Isto E, Italy’s Corriere della Sera, Argentina’s Diario La Nacion, and India’s The Hindu. Dr. Atlas is also the editor of the leading textbook, Magnetic Resonance Imaging of the Brain and Spine, in its fifth edition and translated into Mandarin, Spanish, and Portuguese. Dr. Atlas received the 2011 Alumni Achievement Award, the highest career achievement honor for a distinguished alumnus from the University of Illinois in Urbana-Champaign. He received an MD degree from the University of Chicago School of Medicine. 1"Average Individual Health Insurance Premiums Increased 99% Since 2013, the Year Before Obamacare, & Family Premiums Increased 140%, According to eHealth.com Shopping Data," eHealth, news release, January 23, 2017, accessed October 19, 2018, https://news.ehealthinsurance.com/news/average-individual-health-insurance-premiums-increased-99-since-2013-the-year-before-obamacare-family-premiums-increased-140-according-to-ehealth-com-shopping-data. 2 "County by County Analysis of Plan Year 2018 Insurer Participation in Health Insurance Exchanges," Centers for Medicare & Medicaid Services, accessed October 19, 2018, https://www.cms.gov/CCIIO/Programs-and-Initiatives/Health-Insurance-Marketplaces/Downloads/2017-10-20-Issuer-County-Map.pdf. 3 Ashley Semanskee, Gary Claxton, and Larry Levitt, "How Premiums Are Changing in 2018," November 29, 2017, Kaiser Family Foundation, accessed October 19, 2018, https://www.kff.org/health-reform/issue-brief/how-premiums-are-changing-in-2018. 4 Chris Sloan and Elizabeth Carpenter, "Exchange Plans Include 34 Percent Fewer Providers than the Average for Commercial Plans,"Avelere, news release, July 15, 2015, accessed October 19, 2018, http://avalere.com/expertise/managed-care/insights/exchange-plans-include-34-percent-fewer-providers-than-the-average-for-comm. 5Caroline F. Pearson and Elizabeth Carpenter, "Plans with More Restrictive Networks Comprise 73% of Exchange Market," November 30, 2017, accessed October 19, 2018, http://avalere.com/expertise/managed-care/insights/plans-with-more-restrictive-networks-comprise-73-of-exchange-market. 6 Leemore Dafny, "Hospital Industry Consolidation—Still More to Come?" New England Journal of Medicine 370 (January 16, 2014): 198–99, accessed October 19, 2018, doi:10.1056/NEJMp1313948. 7 Martin Gaynor, Farzad Mostashari, Paul B. Ginsburg, "Making Health Care Markets Work: Competition Policy for Health Care," Journal of the American Medical Association 317 (April 4, 2017): 1313–14. 8 Martin Gaynor and Robert J. Town,"The Impact of Hospital Consolidation," Robert Wood Johnson Foundation, June 1, 2012, accessed October 19, 2018, https://www.rwjf.org/en/library/research/2012/06/the-impact-of-hospital-consolidation.html. 9 James C. Robinson and Kelly Miller, "Total Expenditures per Patient in Hospital-Owned and Physician-Owned Physician Organizations in California," Journal of the American Medical Association 312, no 16 (2014): 1663–69, accessed October 20, 2018, doi:10.1001/jama.2014.14072. 10 Cory Capps, David Dranove, and Christopher Ody, "The Effect of Hospital Acquisitions of Physician Practices on Prices and Spending," Institute for Policy Research, Northwestern University, Working Paper 15-02, February 2015. 11"California: Health Coverage and Uninsured," Kaiser Family Foundation, accessed September 24, 2018, https://www.kff.org/state-category/health-coverage-uninsured/?state=CA; and Kaiser Family Foundation, “Facts on Health Reform,” October 2009. 12 “Physician Appointment Wait Times and Medicaid and Medicare Acceptance Rates, 2014 Annual Survey,” Merritt Hawkins. 13 Department of Health and Human Services, “Access to Care: Provider Availability in Medicaid Managed Care,” Report OEI-02-13-00670, December 2014, accessed October 20, 2018, http://oig.hhs.gov/oei/reports/oei-02-13-00670.pdf. 14 Kaiser Family Foundation, "California: Health Coverage and Uninsured." 15 Louise Norris, "California and the ACA’s Medicaid Expansion," Health Insurance & Health Reform Authority, January 21, 2017, accessed October 20, 2018, https://www.healthinsurance.org/california-medicaid. 16US Department of Health and Human Services, "California Made Medicaid Payments on Behalf of Newly Eligible Beneficiaries Who Did Not Meet Federal and State Requirements," Report A-09-16-02023, February 2018. 17 Glenn A. Melnick and Katya Fonkych, "Hospital Prices Increase in California, Especially Among Hospitals in the Largest Multi-hospital Systems," Inquiry: The Journal of Health Care Organization Provision and Financing 53 (June 2016): 1–7. 18 Angela Hart, "The Price Tag on Universal Health Care Is in, and it’s Bigger than California’s Budget," Sacramento Bee, May 23, 2017, accessed October 20, 2018, https://www.sacbee.com/news/politics-government/capitol-alert/article151960182.html. 19 Bacchus Barua and Sazid Hasan, "The Private Cost of Public Queues for Medically Necessary Care, 2018," Fraser Institute, May 23, 2018, accessed October 20, 2018, https://www.fraserinstitute.org/studies/private-cost-of-public-queues-for-medically-necessary-care-2018. 20 Siva Anandaciva, Joni Jabbal, David Maguire, and Deborah Ward, "How is the NHS Performing? June 2018 Quarterly Monitoring Report," The King’s Fund, accessed October 20, 2018, https://www.kingsfund.org.uk/publications/how-nhs-performing-june-2018. 21 NHS England, "Consultant-led Referral to Treatment Waiting Times Data 2018–2019," accessed October 20, 2018, https://www.england.nhs.uk/statistics/statistical-work-areas/rtt-waiting-times/rtt-data-2018-19. 22 Bacchus Barua, "Waiting Your Turn: Wait Times for Health Care in Canada, 2017 Report," Fraser Institute, December 7, 2017, accessed October 20, 2018, https://www.fraserinstitute.org/studies/waiting-your-turn-wait-times-for-health-care-in-canada-2017. 23"2009 Survey of Physician Appointment Wait Times," Merritt Hawkins. 24 "2017 Survey of Physician Appointment Wait Times," Merritt Hawkins, accessed October 20, 2018, https://www.merritthawkins.com/uploadedFiles/MerrittHawkins/Content/Pdf/mha2017waittimesurveyPDF.pdf. 25 NHS England, "Cancer Waiting Times, 2018-2019 Q1," accessed October 20, 2018, https://www.england.nhs.uk/statistics/statistical-work-areas/cancer-waiting-times; NHS England, "Referral to Treatment (RTT) Waiting Times Statistics for Consultant-led Elective Care 2015/16 Annual Report," June 9, 2016, accessed October 20, 2018, https://www.england.nhs.uk/statistics/wp-content/uploads/sites/2/2013/04/RTT-Annual-Report-2015-16-v3_final.pdf. 26 Bengt Jönsson and Nils Wilking, "Market Uptake of New Oncology Drugs," Annals of Oncology 18, supplement 3 (April 2007): iii31–48. 27 Samantha A. Roberts, Jeff D. Allen, and Ellen V. Sigal, "Despite Criticism of the FDA Review Process, New Cancer Drugs Reach Patients Sooner in the United States than in Europe," Health Affairs 30, no. 7 (July 2011), accessed October 20, 2018, https://doi.org/10.1377/hlthaff.2011.0231. 28 US Food and Drug Administration, Center of Drug Evaluation and Research, "Novel Drugs 2015," Summary, January 2016. 29 Yuting Zhang, Hana Hueser, and Immaculada Hernandez, "Comparing the Approval and Coverage Decisions of New Oncology Drugs in the United States and Other Selected Countries,” Journal of Managed Care & Specialty Pharmacy 23, no. 2 (February 2017): 247-54. 30 National Institute for Health and Care Excellence, "Changes to NICE Drug Appraisals: What You Need to Know," April 4, 2017, accessed October 20, 2018, https://www.nice.org.uk/news/feature/changes-to-nice-drug-appraisals-what-you-need-to-know. 31David H. Howard, Lisa C. Richardson, and Kenneth E. Thorpe, "Cancer Screening and Age in the United States and Europe," Health Affairs 28, no. 6 (November 2009), accessed October 20, 2018, https://doi.org/10.1377/hlthaff.28.6.1838. 32 June E. O'Neill and Dave M. O'Neill, "Health Status, Health Care and Inequality: Canada vs. the U.S.," in Frontiers in Health Policy Research, vol. 10, ed. David M. Cutler, Alan Garber, and Dana P. Goldman (Berkeley Electronic Press, 2007). 33 Arduino Verdecchia et al., “Recent Cancer Survival in Europe: A 2000–02 Period Analysis of EUROCARE-4 Data,” Lancet Oncology 8, no. 9 (September 2007) 784–96; Emmanuela Gakidou et al., "Management of Diabetes and Associated Cardiovascular Risk Factors in Seven Countries: A Comparison of Data from National Health Examination Surveys," Bulletin of the World Health Organization 89, no. 3 (March 2011): 172-83; June E. O'Neill and Dave M. O'Neill, "Health Status, Health Care and Inequality: Canada vs. the U.S.," NBER Working Paper No. 13429, September 2007; Y. Richard Wang, G. Caleb Alexander, and Randall S. Stafford, "Outpatient Hypertension Treatment, Treatment Intensification, and Control in Western Europe and the United States," Archives of Internal Medicine 167, no. 2 (January 2007):141–47; Katharina Wolf-Maier, "Hypertension Treatment and Control in Five European Countries, Canada, and the United States," Hypertension 43, no. 1 (January 2004): 10; Padma Kaul et al., “Long-term Mortality of Patients with Acute Myocardial Infarction in the United States and Canada: Comparison of Patients Enrolled in Global Utilization of Streptokinase and T-PA for Occluded Coronary Arteries (GUSTO)-I,” Circulation 110, no. 3 (September 28, 2004):1754–60; Kenneth E. Thorpe, David H. Howard, and Katya Galactionova, "Differences in Disease Prevalence as a Source of the U.S.-European Health Care Spending Gap," Health Affairs 26, no. 6 (November 2007): w678–86; O'Neill and O'Neill, "Health Status, Health Care and Inequality," NBER. 34 O'Neill and O'Neill, "Health Status, Health Care and Inequality," Cutler, Garber, and Goldman; Melissa L. Martinson, Julien O. Teitler, and Nancy E. Reichman, "Health Across the Life Span in the United States and England," American Journal of Epidemiology 173, no. 8 (April 2011); FDA, “Novel Drugs”; Zhang, Hueser, and Hernandez, “Comparing the Approval and Coverage Decisions of New Oncology Drugs." 35 Robert J. Blendon et al., "Confronting Competing Demands to Improve Quality: A Five-Country Hospital Survey," Health Affairs 23, no. 3 (May–June 2004):119–35; Robert J. Blendon et al., “Inequities in Health Care: A Five-country Survey,” Health Affairs 21, no. 3 (May–June 2002): 182–91; Paul Lee, Richard L. Abbott, and William Rich III, "Patient Outcomes and Cataract Surgery Volume," Ophthalmology 114, no. 3 (March 2007):403–04; Hélène Boisjoly et al., "Reducing Wait Time for Cataract Surgery: Comparison of 2 Historical Cohorts of Patients in Montreal," Canadian Journal of Ophthalmology 45, no. 2 (April 2010):135–39; Stefania M. Mojon-Azzi and Daniel S. Mojon, "Waiting Times for Cataract Surgery in Ten European Countries: An Analysis Using Data from the SHARE Survey," British Journal of Ophthalmology 91, no. 3 (March 2007): 282–86. 36 Sarah Neville. “NHS Funds Diverted to Private Sector,” Financial Times, March 26, 2017. 37"Sweden’s Pharmacy Monopoly Finished," The Local (Sweden), July 1, 2009, accessed October 21, 2018, http://www.thelocal.se/20396/20090701/#. 38 "Private Medical Insurance in the European Union," CEA Insurers of Europe, January 2011. 39"Healthcare Spending among Privately Insured Individuals under Age 65," IMS Institute for Healthcare Informatics, February 2012. 40 Michael H. Lee, Jeremiah D. Schuur, and Brian J. Zink, "Owning the Cost of Emergency Medicine: Beyond 2%," Annals of Emergency Medicine 62, no. 5 (November 2013): 498. 43Sze-jung Wu, Gosia Sylwestrzak, Christiane Shah, and Andrea DeVries, "Price Transparency for MRIs Increased Use of Less Costly Providers and Triggered Provider Competition," Health Affairs 33, no. 8 (August 2014): 1391–98, accessed October 21, 2018, http://content.healthaffairs.org/content/33/8/1391.abstract; James C. Robinson, Timothy Brown, and Christopher Whaley, "Reference-Based Benefit Design Changes Consumers' Choices And Employers' Payments For Ambulatory Surgery," Health Affairs 34, no. 3 (March 2015): 415–22, accessed October 21, 2018, http://content.healthaffairs.org/content/34/3/415.abstract. 44 James T. O’Connor, “Comprehensive Assessment of ACA Factors That Will Affect Individual Market Premiums in 2014,” Milliman Reports, April 25, 2013, accessed October 21, 2018, http://www.iss4all.com/MillimanACAPremiumReport4252013.pdf. 46 “Global Pharma and Biotech,” Credit Suisse, April 18, 2017. 47"Pharmacists Survey: Prescription Drug Costs Skewed by Fees on Pharmacies, Patients," news release, National Community Pharmacists Association, June 28, 2016. 48 Karen Van Nuys, Geoffrey Joyce, Rocio Ribero, and Dana P. Goldman, "Frequency and Magnitude of Co-payments Exceeding Prescription Drug Costs," Journal of the American Medical Association 319, no. 10 (March 2018):1045–47, accessed October 21, 2018, doi:10.1001/jama.2018.0102. 49Lisa L. Gill, “Shop Around for Lower Drug Prices,” Consumer Reports, April 5, 2018, accessed October 21, 2018, https://www.consumerreports.org/drug-prices/shop-around-for-better-drug-prices. 50 J. Scott Ashwood et al., "Trends in Retail Clinic Use among the Commercially Insured," American Journal of Managed Care 17, no. 11 (November 2011): e443-48. 51Ateev Mehrotra, "The Costs and Quality of Care for Three Common Illnesses at Retail Clinics as Compared to Other Medical Settings," Annals of Internal Medicine 151, no. 5 (September 2009): 321–28. 52 Robin M. Weinick et al., "Policy Implications of the Use of Retail Clinics," RAND Corporation, 2010, accessed October 21, 2018, https://www.rand.org/pubs/technical_reports/TR810.html. 53 Michael J. Dill and Edward S. Salsberg, "The Complexities of Physician Supply and Demand: Projections through 2025," Association of American Medical Colleges, November 2008. 54Tax expenditure report 2017–18, California Department of Finance. 55Sean P. Keehan et al., "National Health Expenditure Projections, 2014–2024: Spending Growth Faster than Recent Trends," Health Affairs 34, no. 8 (August 2015): 1407–17, accessed October 21, 2018, http://content.healthaffairs.org/content/early/2015/07/15/hlthaff.2015.0600. 56Scott W. Atlas, Restoring Quality Health Care: A Six-Point Plan for Comprehensive Reform at Lower Cost (Stanford, CA: Hoover Institution Press, 2016).